A LIVESTRONG Survivorship Center of Excellence, made possible by the V Foundation and LIVESTRONG. Anyone diagnosed with cancer, from the time of diagnosis through the rest of his or her life. Survivorship describes the experience of moving beyond cancer diagnosis and treatment toward wellness. Thanks to earlier detection, innovative medical treatments and supportive care from family and friends, there are now more than 12 million cancer survivors in the United States today. As even more progress is made in the fight against cancer and the number of survivors continue to grow, health care providers must have programs and resources in place to help survivors achieve the best quality of life possible. UNC Lineberger Comprehensive Cancer Center and the N.C. Cancer Hospital are committed to providing cancer survivorship services for North Carolinians and have been invited to join the Lance Armstrong Foundation’s LIVESTRONG Survivorship Center of Excellence Network and created Carolina Well-the UNC Lineberger Survivorship Program! UNC Lineberger is the eighth network member institution in the nation and the only one in the Southeast. From the outside looking in, most people think coming to the end of treatment should be a time of joy and ease. However for many survivors when the routine of treatment ends it can be a time of mixed emotions- a time for celebration, yet also a time of more challenges. Many survivors often liken the transition to being cast adrift — they’re not sure what comes next and they feel lost about moving forward. What about the side effects of treatment? How do I get back to “normal”? Is there a new “normal”? In addition, though many survivors feel well, others can experience lingering health issues, financial consequences, and social concerns. 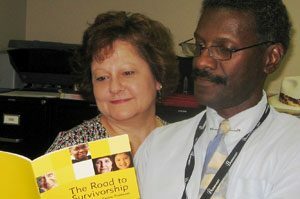 What Survivorship services are available? It is important for you to know there are tools available to help you move beyond the illness and positively impact the quality of your life. It is also important to take care of yourself, to make follow-up appointments with your health care provider and make sure you let them know of any physical or emotional things that may be bothering you, including things that get in the way of your daily life and well-being. Survivorship programs and clinics can help you and your family address these concerns and help you feel better-in body and mind. Get other referrals as needed, for example: symptom management or medication clinics, nutrition consult, etc. Call 919-966-3494 to schedule an appointment for the following clinics: General Transitions Survivorship Clinic, Breast Survivorship Clinic, Testicular Survivorship Clinic, and the Bone Marrow Transplant Long Term Follow-Up Clinic. You will find an array of tools to help you survive cancer with confidence. Attend one of our Transitions sessions- a four to six week group program for cancer survivors and their caregivers that offers education, support and expert speakers on medical issues, exercise, nutrition and emotional needs that survivors may face after treatment. Visit the Calendar of Events page or the Cancer Transitions page which lists our programs across North Carolina.